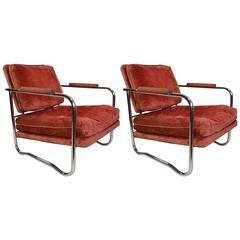 Pair of well worn but sturdy Art Deco armchairs. Manufacturer as shown on labels: American fixture and showcase MFG Co MFGS of Korrect- Way products Upholstery is original "Textile Leather". Chrome rusted in places. Upholstery fabric a little frayed. Slightly distressed, vintage honey colored leather chairs. Sold individually. Offered at . 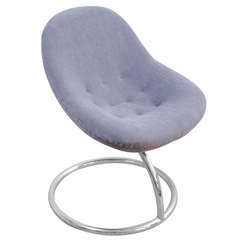 Set of three side chairs and one armchair with chrome-plated tubular steel frames and original vinyl upholstery. Sold as is.